Teladoc doctors have said an accurate temperature reading is helpful for diagnosing the most common illnesses. 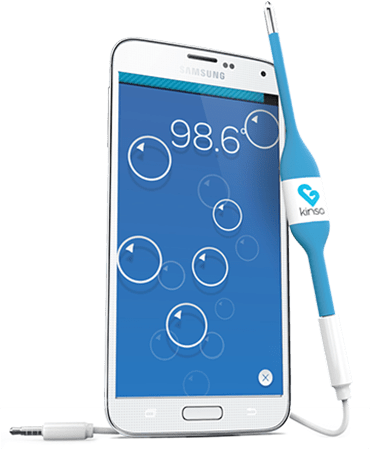 Teladoc is offering you 25% off Kinsa's Smart Thermometer - the first-ever FDA-cleared, app-enabled thermometer! Professional accurate reading in just 10 seconds! Works whenever you need it - no batteries means it won't break or die! Teladoc can treat many of the common illnesses that are accompanied by a fever such as: cold, flu, upper respiratory infection, urinary tract infection, and more. With Teladoc you can talk with a board-certified doctor by phone, web or mobile app. You can use this benefit for non-emergency healthcare 24 hours a day, 365 days a year. If medically necessary, a prescription will be sent to your pharmacy of choice. © 2016 Teladoc, Inc. All rights reserved. Teladoc and the Teladoc logo are trademarks of Teladoc, Inc. and may not be used without written permission. Teladoc is being provided to fully-insured Aetna members and members of plans administered by Aetna. Teladoc is also provided to self-insured Aetna members and members of plans administered by Aetna whose employer has elected to offer the program to their employees. Teladoc and Teladoc physicians are independent contractors and are neither agents nor employees of Aetna or plans administered by Aetna. Teladoc is not available in all states. Teladoc does not replace the primary care physician. Teladoc does not guarantee that a prescription will be written. Teladoc operates subject to state regulation and may not be available in certain states. Teladoc does not prescribe DEA controlled substances, non-therapeutic drugs and certain other drugs which may be harmful because of their potential for abuse. Teladoc physicians reserve the right to deny care for potential misuse of services.